Christmas came early this year for Poco. 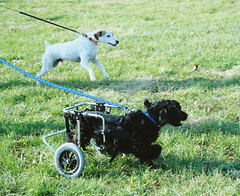 About a month ago she got her Doggon' Wheels that help her to walk and run around (see previous post here for background on why she needed them). She loves them! Here she is racing her best dog friend, Jackson. Hope your Christmas was also great! Great photo! You can tell Poco is having fun by the wind beneath her flopping ears! Jackson is enjoying himself, too. Thanks! Yeah, they both were having a lot of fun.